1) Since October 2013, first aid training providers are no longer approved by the HSE. 2) Employers now have a responsibility for ensuring the quality of the first aid training they provide. ● Those choosing first aid qualifications regulated by Ofqual, SQA or The Welsh Government, are not required to undertake due diligence checks on their training provider. ● Those choosing unregulated first aid training are required justify their selection of training provider through ongoing due diligence checks*. *Due diligence is ‘reasonable investigation’. 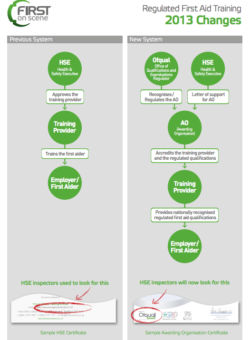 The HSE has produced a detailed seven page guide covering how these checks should be undertaken and the documents that should be requested when regulated qualifications are not chosen. Please note that trade bodies, badge schemes and other third party assurances do not remove the legal responsibility from the employer. If you choose First on Scene as your training provider then you don’t need to do anything. First on Scene only deliver Ofqual regulated first aid at work qualifications, so you can rest assured that you have fulfilled your legal responsibilities for providing quality first aid training, without having to undertake any complicated due diligence checks. Click here to download our simple guide to the changes. To book your training today, simply call 0845 5191 999 or use our online course finder at the top of the page. Alternatively, if you would like any further information or guidance, please call us or email info@firstonscene.co.uk and our friendly customer service team will be delighted to help.